At this narrow point where Lost River flows westerly toward Tule Lake, there is a conjunction of historical events. "Olene" in the Klamath (native American) language means "eddy place." 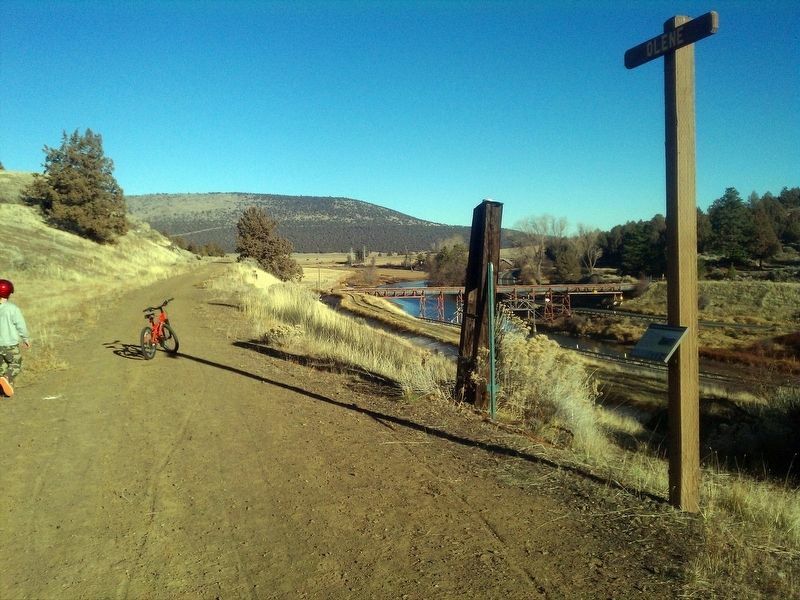 For hundreds, perhaps thousands of years, this site was an important fishery for the Klamath and Modoc tribes. Here the Indians harvested and preserved the Lost River Sucker fish (Deltistes luxatus). At Olene Gap the right-of-way of the OC&E hugs the higher north bank. Below it and south across the river are part of the canal and flume system of the Klamath Reclamation Project. The water in the ditches comes from Gerber Reservoir, an artificial lake created in 1926 on the highlands east of Langell Valley. 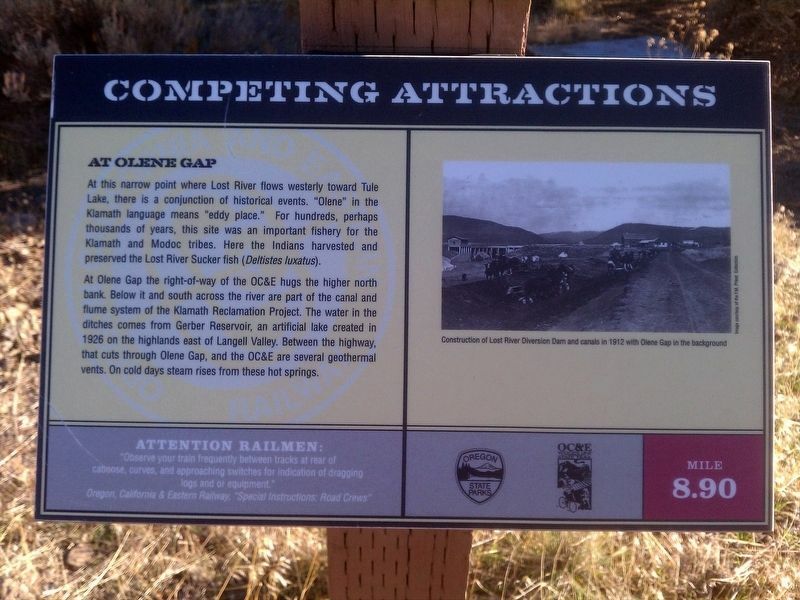 Between the highway, that cuts through Olene Gap, and the OC&E are several geothermal vents. On cold days steam rises from these hot springs. 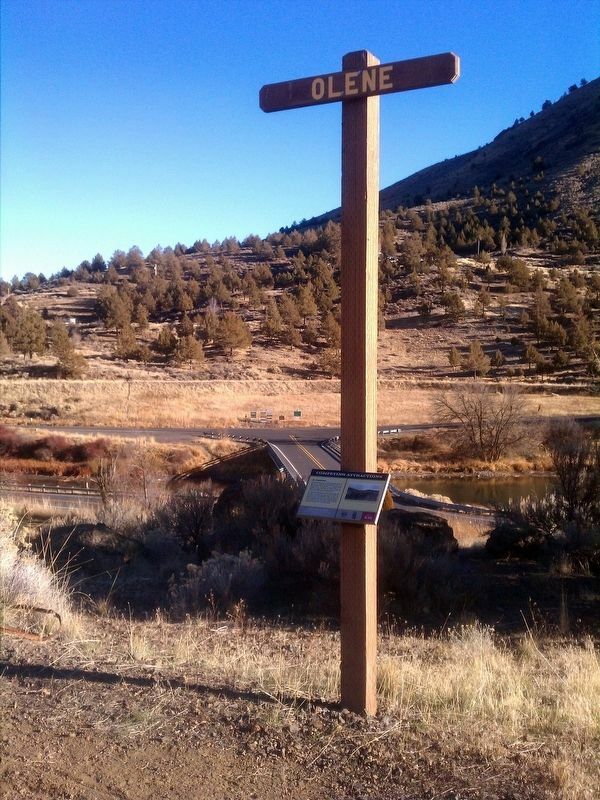 Erected by Oregon State Parks, OC&E Woodsline State Trail. Trail. Touch for map. Marker is in this post office area: Klamath Falls OR 97603, United States of America. Touch for directions. Other nearby markers. At least 8 other markers are within 9 miles of this marker, measured as the crow flies. Lost River Gap and Ford (about 600 feet away, measured in a direct line); Swede’s Cut (approx. 4.2 miles away); Henley School World War II Memorial (approx. 4.3 miles away); Mt. Laki Community Presbyterian Church World War II Memorial (approx. 5.9 miles away); Beginning of a Trail (approx. 7.1 miles away); Stukel Ranch (approx. 7½ miles away); Merganser (approx. 8.8 miles away); a different marker also named Merganser (approx. 8.8 miles away). Touch for a list and map of all markers in Klamath Falls. More about this marker. Marker is one of many located along the OC&E Woodsline State Rails to Trail. More. Search the internet for Competing Attractions. Credits. This page was last revised on January 20, 2018. This page originally submitted on January 17, 2018, by Douglass Halvorsen of Klamath Falls, Oregon. This page has been viewed 58 times since then and 7 times this year. Photos: 1, 2, 3. submitted on January 17, 2018, by Douglass Halvorsen of Klamath Falls, Oregon. • Bill Pfingsten was the editor who published this page.